USB-CNV3 programming cable is suitable for the Fuji N series ( NB/NJ/NS/SPB/NW0) support the maximum communication distance of 1.5 km. The working temperature: - 20 to + 75 degrees C.
This USB-CNV3 cable is a suitable replacement of USB programming cable for Fuji NB/NJ/NS . This cable simulate USB port as traditional serial port (usually COM3), which enables existing programming software to communicate through simulated traditional port and PLC devices. 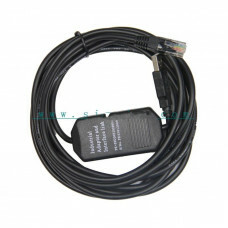 Embedded with this cable is the necessary data conversion equipments to communicate between PLC end to and PC USB end. Support Flex V1.0 and above. Support Windows 7/2000/Windows XP (WinNT4/95/98/Me/DOS NOT SUPPORTED). Smart LED indicator. Auto identification of optical isolation status. baud rate: 300 bps ~ 1Mbps automatically adaptive. USB device drivers should be installed before using programming cable, which are available on the CD-ROM sold together with the cable. And for the specific installation steps, please refer to the instruction files on the CD-ROM drivers, and details are not necessarily listed here. After completing Driver installation, the corresponding COM port for the programming cable will be displayed in the Device Manager of Window. The step next is just to choose this COM port in the programming software and other application software and keep other communication parameters as in the Default settings. And the following steps are exactly the same as in the traditional programming cables with RS232 interfaces.